The biggest issue with a traditional step ladder is that people will undoubtedly use them in a closed position, leaned up against a wall. The feet of traditional aren’t designed to handle the required angle for leaning and the rails typically aren’t rated for that type of force. Another opportunity is working on ladders at corners or unfinished walls, which make the ladder unsecure and prone to movement. 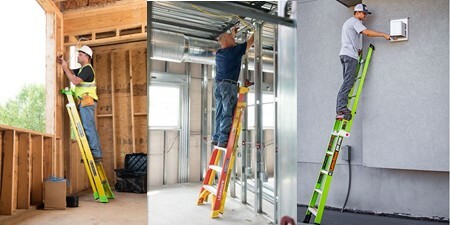 Werner, Little Giant, and Louisville Ladder have all recently released a redesigned step ladder which solve many of the most common issues with them. Check out the details of the 3 different ladders below and let me know what you think of them! The Werner LEANSAFE series comes in lengths from 4 feet to 12 feet. Its design is specifically formulated to not only function like a traditional step ladder, but also safely lean in a closed position against a wall or corner/unfinished wall. When the ladder is in a closed position, the secure rail latch engages to keep the front and back rails locked together. The ladder is rated for 300 pounds and features a notched out top to hug wall corners or exposed studs. In order to differentiate this ladder series from a traditional style, Werner has smartly designed it to be multi colored. The climbing side is yellow and the opposite side is orange, which will help safety managers identify that the ladder is safe to be leaned. Taking the multi-positional design concept to the next level is Little Giant with their King Kong Kombo. Not only does the step ladder allow for safe leaning with a 375 pound weight rating, it also articulates into an extension ladder. The company claims it’s the world’s first stepladder, extension ladder, and lean-to ladder combination. Just like the Werner, the King Kombo is designed to hug wall corners and studs, but their version is a flip out design, as opposed to being a static design element in the top of the ladder. The King Kombo currently comes in both a 5 foot step (8’ extension) and a 6’ step (10’ extension). The Louisville CrossXStep has many of the same features as the Werner above, although it does have an increased weight capacity at 375 pounds versus Werner’s 300 pounds. Louisville uses hi vis green on the top shelf and shoes to differentiate it from traditional step ladders signify that the ladder is safe for leaning. Just like the other 2 above, the CrossXStep ladder features a v-shaped top for safe use on wall corners and exposed studs. An integrated lock latch secures the backside of the ladder to the front when in a closed position, as well. This ladder is available in a variety of sizes, ranging from 4 feet to 12 feet.